Larsen and Tubro showcased it's autonomous underwater vehicle once again in the defense expo, which was front running in the Navy's tender to procure ten such tube launched AUV's. 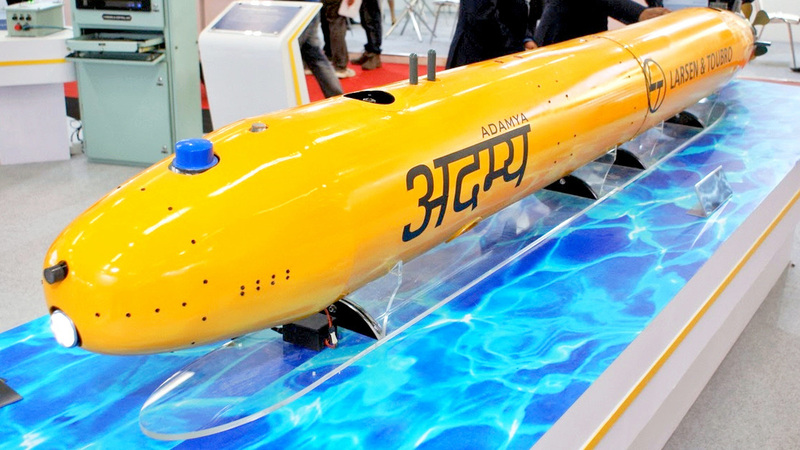 The Adamya AUV made by L&T capable to be launched from submarines 533mm torpedo tubes. Which having operational endurance of more than eight hours. The Adamya AUV can be launched from submarine torpedo tube without having any further modifications in the submarine, it can also be launched from surface ships with simple launch and recovery systems comes with the Adamya AUV pack. Adamya is five meters long heavy weight AUV is designed to perform underwater mission for so long time, L&T says the Adamya's underwater endurance is more than eight hours with the speed of some 4 knots. which can dive upto 1500 feet. with the operational payload of multiple systems can be customized by the user. The AUV can undertake various missions which include, Hydrographic survey, underwater mine detection and countermeasure, Intelligence surveillance and reconnaissance mission, offshore survey, harbor security, clandestine monitoring, environmental monitoring and anti submarine operations. The payloads can be switched by respective missions. with the capacity of some 50 kilo grams. In the front section of payload, it can carry a forward looking sonar, an underwater camera, CTD sensor ( Conductivity, Temperature and depth ), and a customized payload. afterwards it comes with a large space for customized payload along with other connectivity solutions. This where most of the mission payloads can be kept. The vehicle controlled by a combination of Doppler velocity logger, Intertial navigation system and GPS. The AUV powered by a Lithium Polymer battery which can give enough power supply to the AUV to work upto eight hours at an nominal speed of some 4 knots. The AUV propelled by a contra rotating blades and two thrusters which is located in forward and end section. The real time data can transmitted from the AUV using the on-board systems like RF Antenna, Wi fi and Acoustic modem, which can communicate easily to the mother ship or friendly warships close by. The Adamya AUV ready for productions and trails, which navy is yet to sanctioned by Ministry to buy the AUV from L&T. Every warships nowadays has such AUV's for multi mission. While Indian Navy yet to acquire.